This paper is based on an ethnobotanical project, carried out in the remote Hindu Kush mountain region of District Swat, Pakistan. The prime objectives of the project were to explore the conservation status, folk medicinal knowledge and traditional pre and post harvesting techniques of some economically important medicinal plants of the area. It was observed that 49 medicinal plants belonging to 32 families were collected and traded in the herb markets of Swat. Most of these plants are used by local population for curing different ailments, while some are exported to other parts of Pakistan. The traditional plant collection techniques have resulted in huge losses of these valuable plant resources. The conservation assessment of these plants revealed that due to increased exploitation and un-sustainable harvesting, 49% of these economically valued medicinal plant species are threatened. Plant containing active chemical constituents in any of its part or parts like root, stem, leaves, bark, fruit and seed which produces a definite curing physiological response in the treatment of various ailments in humans and other animals is termed as medicinal plant. The various chemicals work together to reach equilibrium in the body as they do in the plant, and so produce gentle progressive healing within the body tissues. From the earliest times mankind has used medicinal plants in an attempt to cure diseases and relieve physical suffering. Medicinal plant knowledge has usually resulted from trial and error, and was based on speculation and superstition. Medicinal plants remain the prime source of primary health care throughout the world for thousands of years. However, in the middle of 20th century, the contribution of medicinal plants was reduced by approximately one fourth as researchers favored the use of synthetic chemicals for curing diseases. Now this trend is reversing in favor of medicinal plants as they contain natural products that are chemically balanced, effective and least injurious with none or much reduced side effects as compared to synthetic chemicals. Herbal medicine is thus experiencing a revival in Western society, along with other complementary therapies such as Traditional Chinese Medicine, Osteopathy, and Homeopathy. In general, people are becoming more aware of the harmful side effects of artificial commodities and are realizing the benefits of a more natural way of life. It has been estimated that about 20,000 plant species are used for medicinal purposes throughout the world. According to World Health Organization report (2002), 70% of the world population use medicinal plants for curing diseases through their traditional practitioners. In sub-continent, plant oriented drugs are used extensively and from a very long time. According to a survey conducted by W.H.O., traditional healers treat 65% patients in Srilanka, 60% in Indonesia, 75% in Nepal, 85% in Mayanmar, 80% in India and 90% in Bangladesh. In Pakistan, 60% of the population, especially in villages is getting health care by traditional practitioners (Hakims), who prescribe herbal preparations (Haq, 1983). Developed countries, are turning to the use of traditional medicinal systems that involve the use of herbal drugs and remedies. About 1400 herbal preparations are used widely, according to a recent survey in Member States of the European Union. Herbal preparations are popular and are of significance in primary healthcare in Belgium, France, Germany and the Netherlands. Such popularity of healthcare plant-derived products has been traced to their increasing acceptance and use in the cosmetic industry as well as to increasing public costs in the daily maintenance of personal health and well being. Examples of such beauty-oriented therapeuticals are skin tissue regenerators, anti-wrinkling agents and anti-age creams. Most dermaceuticals are derived from algal extracts that are rich in minerals and the vitamin B group. Skincare products such as skin creams, skin tonics, etc. derived from medicinal plants are grouped together as dermaceuticals. Also, amongst the poor, cures and drugs, derived from plants, constitute the main source of healthcare products (Hoareau and Da Silva, 1999). The practice of traditional medicine is widespread in China, India, Japan, Pakistan, Sri Lanka and Thailand. In China about 40% of the total medicinal consumption is attributed to traditional tribal medicines. In Thailand, herbal medicines make use of legumes encountered in the Caesalpiniaceae, the Fabaceae, and the Mimosaceae. In the mid 90s, it is estimated that receipts of more than US$ 2.5 billion have resulted from the sales of herbal medicines. In Japan, herbal medicinal preparations are more in demand than mainstream pharmaceutical products. The development and commercialization of medicinal plant based bio-industries in the developing countries is dependent upon the availability of facilities and information concerning upstream and downstream bio-processing, extraction, purification, and marketing of the industrial potential of medicinal plants. Absence of such infrastructure compounded by lack of governmental interest and financial support restricts the evolution of traditional herbal extracts into authenticated market products. Furthermore the absence of modernized socio-economic and public healthcare systems reinforces reliance of rural and low income urban populations on the use of traditional medicinal herbs and plants as complementary aids to routine pharmaceutical market products. The valley of Swat is located in the remote Hindu-Kush mountains of Pakistan. The valley of Swat is one of the most scenic places of sub-continent and is called Switzerland of the sub-continent. Swat has large number of beautiful valleys and also innumerable monuments of ancient Ghandhara civilization. Swat is situated at the northwest corner of Pakistan. It lies from 34° 34' to 35° 55' north latitudes and 72° 08' to 72° 50' east longitudes. It is bounded by Chitral and Ghizer on the north, Indus Kohistan and Shangla on the east, Buner and Malakand protected area on the south and Dir on the west (Anonymous, 1998). The total area of the Swat is 5337 Km-2 and population of about 1.3 million. Swat is part of the Malakand Division. 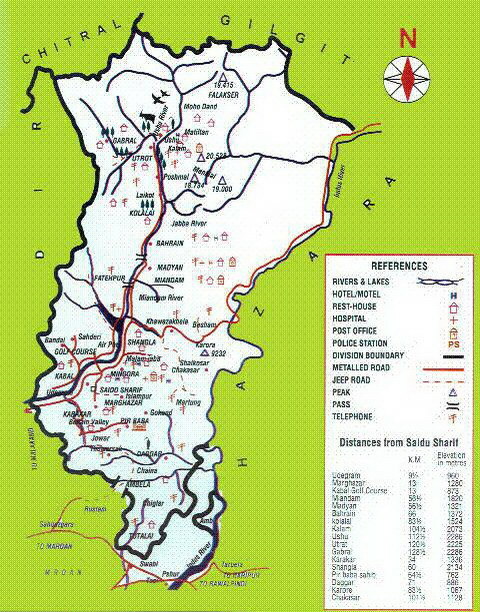 Swat has predominantly rural population. It is inhabited by Yousafzai Pathans, Mians, Kohistanis, Gujars and Pirachas. The Pashto speaking Yousafzai Pathans are the direct descendants of Afghan of Ghazni. The Gujars and Kohistanis, who speak their own dialects of Gujri, Garwi, Torwali and Kohistanis inhabit the mountainous areas up north. The Kohistanis are settled in and around Kalam, Ushu, Utror and Gabral valleys. The nomadic Gujars also form a substantial part of the population in the northern parts of Swat valley. Swat, has been home to Buddhism from about 6th century BC to 7th century AD. 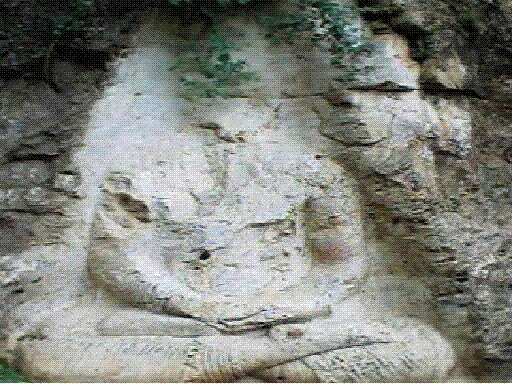 Buddhism flourished in Swat and spread to other parts of Asia from here. 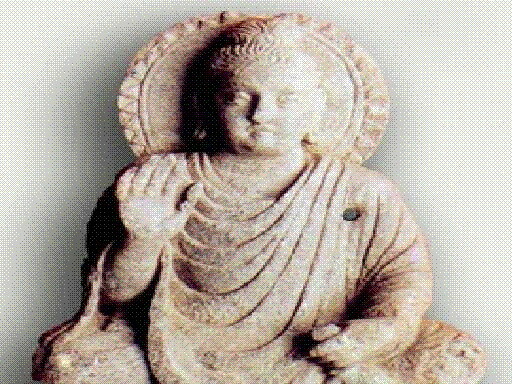 This great progress became possible due to personal dedication of King Ashoka to Buddhism. During his reign, Buddhism spread to Tibet, China, Bhutan, Korea and Japan. Many monasteries have been found, where monks were used to live. Some historians consider Swat as the center of Ghandhara civilization. District Swat contains about 1550 taxa of flowering plants and 55 Pteridophytes. There are seven types of forests from tropical dry deciduous to alpine. There are various reports about ethnobotanically important medicinal plants; the number varies from 55 to 345 species in Swat (Ahmad & Sirajuddin, 1996). The flora of swat is very diverse and unique as the area is a nexus of three big mountain ranges namely Karakorum, Hindu-kush and Himalayas. The field work includes interviews, observations and guided field walks/ transects walks. Two methods i.e. observations and interviews were frequently used during the field work. Observations were made while visiting different villages. During this process, local methods of medicinal plants collection, storage, drying, harvesting time, processing and utilization were observed. During field work, interviews were conducted with the local inhabitants, selected informants, the herbalists 'hakims' (local physicians of eastern system of medicine), pansaries (medicinal plants sellers in the local markets). Questionnaire method was adopted during the surveys in order to get qualitative and participatory approach about the plant resources and their utilization by the local people. Questions concerning the utility of different plants, quantity of plants used, rate of consumption, availability, economics/market value was asked. Local people especially plant collectors got valuable information about plants abundance, distribution and localities of their maximum availability. These information's were confirmed through field visits. Personal observations were made in the field keeping several parameters in consideration. These observations include, Range extent and area of occupancy; Exploitation level; Plants availability; Habitat alternation; Conservation efforts; Plant collection techniques; Part collected; Invasive plants; Threats (Pollution, Urbanization, Lack of awareness, Deforestation etc. ).The species were then categorized into Critically Endangered, Endangered, Vulnerable, Rare, Near Threatened and Secure. During the present study, it was observed that 49 medicinal plants species belonging to 32 different families were sold in local markets and thus these play a role in uplifting the socioeconomic conditions of the area. Some of these medicinal plants are traded to national herb markets of Lahore, Karachi and Peshawar. It was observed that out of these 49 medicinal plants 24 plant species are threatened (9 Endangered, 7 Vulnerable and 8 Rare) due to excessive collection from the wild. These plants are also used locally for curing different ailments. In most cases, the market availability status of these medicinal plants have increased, showing an increased inclination of local people towards medicinal plants collection and increased dependency of local population on medicinal plants trade. A brief set of information about these plants is given below. Juglans regia L. [Ghuz] Bark/ leaves Increased Secure Bark (Dandasa) is used for cleaning and sparkling teeth. Decoction of leaves is given in eczema and intestinal worms. Medicinal plant collectors are usually poor villagers. Plant collection is there part time activity besides farming and live stock rearing. They collect medicinal plants during spring and summer season which starts from April to September and sell it in the local market to earn some money. One can see a person coming from a hilltop with a bundle of fuel wood of his head and a bag of medicinal plants in his hands. He handover his bag of medicinal plants to local Pansaris and put in his pocket whatever money he gets. According to Choudhary et al. (2000) about 500 families are involved in medicinal plant collection in Swat and they collect 5000 tons of medicinal plants annually. 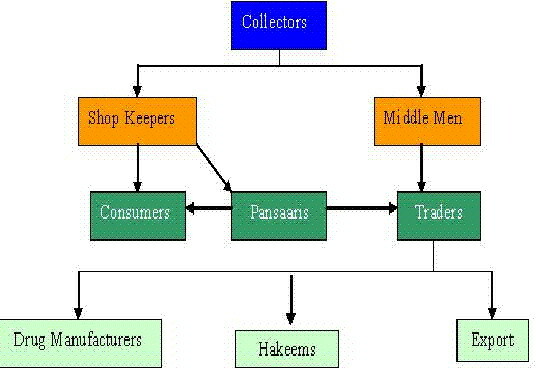 However, no economic analysis exists to date for the marketing chain from collection to consumption systems. It is also necessary to know that how much plant material is collected and passing through the whole process of refinements how much quantity reaches to the market. It will give us the rough picture of the whole system from collection to consumption. It may also be the one reason of overexploitation of highly valuable and endangered medicinal plants. All available data is related to quantities traded in markets at a specific time and their approximate values. Bulk of medicinal plants collected in the area is rhizomatous. The collectors carry with them digging tools and dig medicinal plant wherever found. Major proportions of plants collected are sold in fresh while some plants are stored in bags and sacks from one week to one year. Before storing, these plants are washed and kept under the sun for drying. During storage considerable amounts of medicinal plants are wasted due to humidity, insect attacks, inappropriate storage facilities and lack of awareness on the part of collectors. Medicinal plants are collected extensively during the summer season starting from March when the snow has almost melted to September. The collectors include men, women and children. The women and children collect plants while on their way to work in the fields and surrounding areas of their work place. The women and children of nomads (Ajar) families collect medicinal plants while grazing their livestock. This type of collection of medicinal plants is carried out on daily basis. 1. The collectors are mostly ignorant about the proper time of collection of medicinal plants. An early or late collection of medicinal plants result in an inferior quality of drug. The ideal time of a plant collection is that when plant contain maximum amounts of therapeutically active principles. Majority of medicinal plants collected are rhizomatous. These plants are primarily collected in summer and during this period the plant utilize the root chemistry and nutrition for the development of aerial parts and fruit yield. As a result the rhizomes collected are depleted of active chemical constituents. The ideal time for the collection of these plants is winter or early spring (November to February) when the plants are dormant. During this period the plant converts the nutritional chemistry of aerial parts in to alkaloidal contents and stores it in the underground parts. Thus the plant at this stage contains maximum percentage of active ingredients in its rhizome/roots. Beside this the rhizome collection has resulted in a drastic decrease of these medicinal plants in the area. 2. Medicinal plants degraded in terms of their active constituents if they are not properly dried. The local collectors are also unaware of the bleaching effect of sun rays on colored or other light sensitive drugs. The night dew and humidity also deteriorates the quality of these drugs. 3. The plants after collection are packed in bags, sacks and cotton cloths. The collectors use same packing material again and again until fully rotten. The plants are stored in mud huts and some times in the rooms used for dinning and sleeping as well. Large amounts of medicinal plants are thus wasted during packing and storage process. 4. The collectors do not afford to buy vasculums, canisters and other appropriate packing material. Medicinal plants deteriorate if the material is not properly packed and stored. The nature of the packing material has its bearing on the conditions and quality of the stored material. Similarly, the nature of storing place also has a significant effect on the stored material. Factors like temperature, humidity, light can have both direct and indirect adverse effects on the stored material. Improper storage also results in the attacks of moths, insects, beetles and ants. All these factors greatly damage the quality and quantity of the drug. Coordinated efforts are needed for conservation, documentation and sustainable use of medicinal plants. The following recommendations may help towards this goal. Swat is a mountainous area with diverse and unique flora. However, over the last two decades the plant resources has been largely degraded due to indiscriminate deforestation for acquiring cultivation lands, over exploitation of plant resources for economic purposes, urbanization and industrialization trends, population explosion and increased tourism. Different measures are needed on the part of Government of Pakistan and NGO's working in the area, to check practices which have resulted in the degradation of the biodiversity. The involvement of local community in any conservation effort is highly valued as without local community participation and mobilization, conservation efforts can not be effectively materialized. Community awareness projects should be initiated in Swat, to educate the inhabitants of the area about the importance of natural resources for them and their future generations and how to utilize medicinal plants for their better livelihood on sustainable basis. Ahmad, H. & Sirajuddin,1996. Ethnobotanical profile of Swat. In Proc. First Train.Workshop Ethnobot. Appl.Conserv. 202-206. Anonymous, 1998. District Census Report on Swat. PCO, Govt. of Pakistan. Chaudhary, M.S.A., Ali, A., Sher, H. & S. Malik, 2000. Technical Report on Market study of medicinal herbs in Malakand, Peshawar, Lahore and Karachi. SDC- Interco operation, Peshawar. Chaudhri, M.N. & R.A. Qureshi. 1991 .Pakistan's Endangered Flora-II:A checklist of rare and seriously threatened taxa of Pakistan. Pak.Syst. 5(1-2):1-84. Haq, I. 1983. Medicinal plants. Hamdard Foundation Press, Pakistan. WHO. 2002. Word Health Organization Traditional Medicine Strategy 2002-2005; Geneva.